August 08, 2017, 8:15 a.m. In a 1946, George Orwell detailed what he wanted from his ideal public house, the fictitious “Moon Under Water”. While some of Orwell’s preferences have not aged well (such as serving beer in strawberry-pink china mugs and being able to use the pub’s telephone), new YouGov Omnibus research shows that many aspects of Orwell’s ideal pub have stood the test of time. 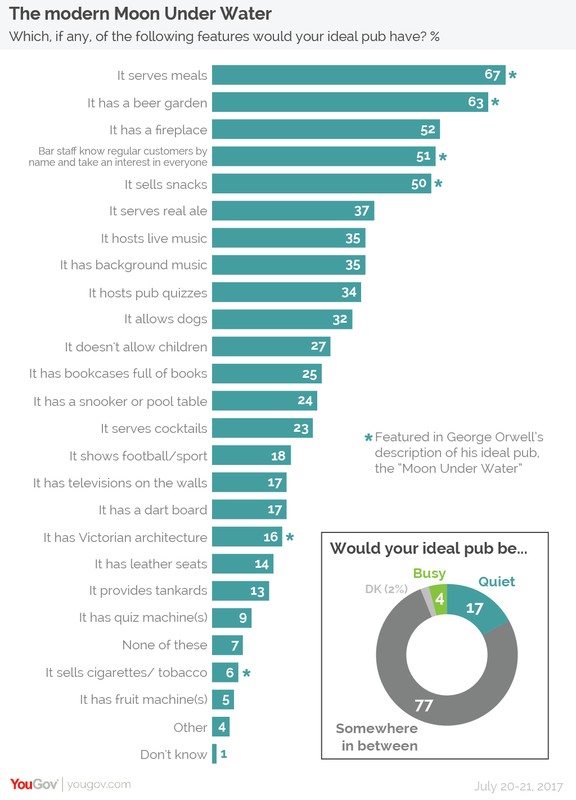 The results show that at least half of Brits agree on five key characteristics their ideal public house would have, four of which featured in Orwell’s essay. The single most important feature of Britons&apos; ideal pub is that it would serve meals (67%). Having a beer garden - the thing Orwell said was the most important - is the second most common feature (63%). The top five features of the ideal pub are rounded off by the presence of a fireplace (52% and the only one of the top five not to be on Orwell’s list), bar staff knowing regular customers and taking an interest in everyone (51%) and selling snacks (50%). Less essential pub features include serving real ale (37%), hosting live music and having background music (both 35%) and hosting pub quizzes (34%). The one armed bandit was the least essential component of the ideal pub, with just 5% of Brits saying that fruit machines would appear in their own personal Moon Under Water. The results also highlight how different men and women’s ideal pubs would be. For instance, women are more likely than men to want their ideal pub to serve meals (74% vs 60%). When it comes to drinks, men are much more likely to say that their ideal pub would serve real ale (46%, vs 28% for women), while women are more likely to want it to serve cocktails (31%, vs 14% for men). When it comes to appearance and ambience, women seem to be the most likely to prefer those walls of hardback books that no-one reads (32% vs 18%). They are also more likely to appreciate the presence of a fireplace (58% vs 45% of men) and have background music (39% vs 30%), while men prefer televisions on the walls (22% vs 13% of women). More men want both televised and pub sports in their ideal boozer. They are more likely than women to want it to show football/sports (27% vs 9% of women), and also have a snooker/pool table (29% vs 19%) and dart board (21 vs 13%).